Rating: 4.2/10. From 158 votes. Summary: The description, specs, photo, pricing, user ratings and user comments for the Heritage Rough Rider 45/410 revolver. a steel frame, cylinder and barrel. 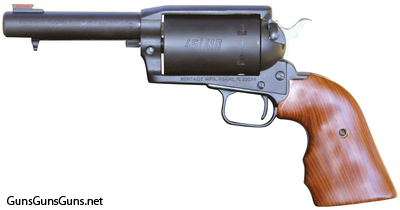 This entry was posted in .410, .45 LC, $251-$500, Full size, Heritage Mfg., Old West, Revolver on May 18, 2011 by Staff. Have a Heritage Rough Rider 45. Is the worst handgun I have ever owned. Will never purchase anything from them again. Bought this heritage 45/410 for home defence,am so pleased with the moderate recoil for all rounds for this revolver that I would recomend it for anyone looking for home defense.It is easily broken down to clean,the fiber optic sight is great for my older eyes. Looks like the best choice for all around survival weapon!. Do you have a stocking distributor for this gun in the Ft Worth TX area ? I have looked for this gun everywhere but have not been able to find it.